This site is owned and operated by Shalom Memorial Park and Shalom Memorial Funeral Home. Access to and use of this site are subject to the following terms and conditions and all applicable laws. By browsing, visiting or otherwise accessing or using this Site, you agree to abide by the terms and conditions set forth below. If you do not agree to these terms, you may not use this site. “Shalom Memorial Park and Shalom Memorial Funeral Home,” and the other tradenames under which Shalom Memorial Park and Shalom Memorial Funeral Home does business are all trademarks of Shalom Memorial Park and Shalom Memorial Funeral Home. Except as specifically permitted in accordance with the terms and conditions governing use of this Site, any use of such trademarks or tradenames is strictly prohibited absent the prior written consent of Event News Network. In addition, the names, tradenames and/or trademarks of third parties, including clients of Shalom Memorial Park and Shalom Memorial Funeral Home , may appear on this Site from time to time. All such names, tradenames and trademarks are proprietary to their respective owners and may be used only with the express written permission of their respective owners. Every user who visits this Site does so at her or his own risk. Shalom Memorial Park and Shalom Memorial Funeral Home makes no representations or warranties of any kind as to (a) the accuracy or completeness of the information or materials contained in this Site, and assumes no responsibility for any errors or omissions in the contents of this Site (which may include factual or typographical errors and/or technical inaccuracies); (b) the availability for use of any copyrighted, trademark or otherwise proprietary materials of third parties which may appear in this Site; (c) the presence or absence of computer viruses or other bugs which third parties may embed in or attach to this Site without Event News Network ‘s knowledge or consent; (d) any software made available for downloading, copying or other use through this Site; or (e) the merchantability, fitness for use, title and/or non-infringement of any or all of the contents of this Site. Regarding communications with Shalom Memorial Park and Shalom Memorial Funeral Home through this Site, Shalom Memorial Park and Shalom Memorial Funeral Home makes no representation or warranty concerning the security of any data transmitted to Shalom Memorial Park and Shalom Memorial Funeral Home, including information relating to potential employment or applications therefor, or any other matter. Shalom Memorial Park and Shalom Memorial Funeral Home shall treat any data or information transmitted to Shalom Memorial Park and Shalom Memorial Funeral Home through this Site as non-confidential and non-proprietary. Neither Shalom Memorial Park and Shalom Memorial Funeral Home nor any other party involved in the creation, production or delivery of this Site, or whose materials or information appear in this Site assumes or accepts any liability, regardless of whether based on contract, negligence, intentional wrongdoing or liability without fault, for any costs, losses, damages (whether direct, indirect, compensatory, special, lost profits, liquidated, consequential or punitive), arising out of or in any way in connection with the user’s access to, browsing of or use of this Site or any of the contents of this Site, without regard to the source of such contents, or with the unavailability or failure of performance of this Site for any reason. Documents, images and information proprietary to Shalom Memorial Park and Shalom Memorial Funeral Home, including the contents of descriptions of Shalom Memorial Park and Shalom Memorial Funeral Home’s businesses, biographical descriptions of its representatives and personnel, press releases and other public notices, together with any associated graphic elements (collectively referred to as ” Event News Network Materials”), may be copied, reproduced, downloaded or otherwise used provided the following terms are adhered to strictly: Copyright notice in the form “© 2007 Shalom Memorial Park and Shalom Memorial Funeral Home. Used With Permission. All Rights Reserved.” must appear in every copy or reproduction of such Shalom Memorial Park and Shalom Memorial Funeral Home Materials. The Shalom Memorial Park and Shalom Memorial Funeral Home Materials may be used solely for non-commercial purposes such as informational, entertainment and personal use, and shall not be further copied, uploaded to any network, intranet or Internet, rebroadcast or retransmitted, or otherwise disseminated in any medium without the express written permission of Shalom Memorial Park and Shalom Memorial Funeral Home. The Event News Network Materials may only be used in their entirety, without alteration, editing, condensation or editorial comment, and any graphical elements contained in the Shalom Memorial Park and Shalom Memorial Funeral Home Materials may not be used separately from the other elements with which they are associated. The Shalom Memorial Park and Shalom Memorial Funeral Home Materials shall not be used to ridicule, disparage, harass or harm any client of Shalom Memorial Park and Shalom Memorial Funeral Home. No other use of Shalom Memorial Park and Shalom Memorial Funeral Home Materials shall be permitted. The Shalom Memorial Park and Shalom Memorial Funeral Home Materials available for use as set forth above do not include the design, layout, arrangement or distinctive elements of this Site, or of any other Internet Web site maintained by Event News Network or its divisions, subsidiaries or affiliated companies. The contents of this Site may from time to time contain documents, images, information and other materials not proprietary to Event News Network, such as photographs, clip art, film clips, musical passages, audio track or sound effect elements, or the names, tradenames, trademarks, logos or designations of third parties (including present and past clients of Shalom Memorial Park and Shalom Memorial Funeral Home or its featured personnel). All such materials will be referred to as “Non- Shalom Memorial Park and Shalom Memorial Funeral Home Materials.” Non- Shalom Memorial Park and Shalom Memorial Funeral Home Materials may also include from time to time articles, data, information, images, artwork, graphics, music, audio or other elements published in newspapers, magazines or other media or venues, and may include the name, tradename or trademark of the medium or venue in which such materials were published. Any use whatsoever of any Non- Shalom Memorial Park and Shalom Memorial Funeral Home Materials is strictly prohibited unless the prior written permission of the appropriate third parties has been secured. For the convenience of users of this Site, one or more links to other Internet Web sites may appear from time to time. Except for Internet Web sites maintained by divisions of Shalom Memorial Park and Shalom Memorial Funeral Home, the Internet Web sites to which links are provided in this Site are not under the control of Shalom Memorial Park and Shalom Memorial Funeral Home. 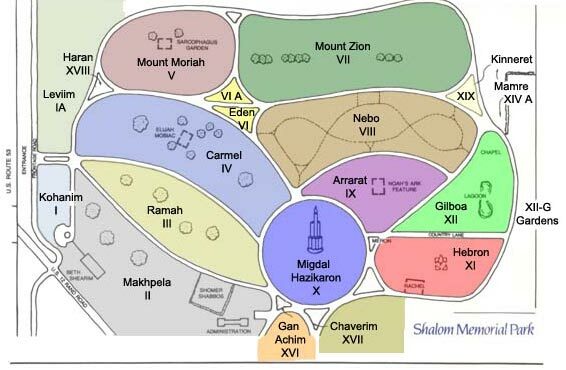 Shalom Memorial Park and Shalom Memorial Funeral Home assumes no responsibility for the contents of any non- Shalom Memorial Park and Shalom Memorial Funeral Home -linked Internet Web site, or for any potential damage arising out of or in connection with the use of any such link. In addition, the existence of a link between this Site and any other Internet Web site is not and shall not be understood to be an endorsement by Shalom Memorial Park and Shalom Memorial Funeral Home of the owner or proprietor of the linked Internet Web site, nor an endorsement of Shalom Memorial Park and Shalom Memorial Funeral Home by the owner or proprietor of such linked Web site. Please note that it is a policy of Shalom Memorial Park and Shalom Memorial Funeral Home not to accept or consider unsolicited creative, production-related or other materials of any kind. Shalom Memorial Park and Shalom Memorial Funeral Home will consider any and all materials, including proposals, ideas, concepts, drafts, rough cuts or finished work product submitted through this Site, not to be confidential or proprietary and to be freely available for use without compensation or payment of any kind.